ThrowRight is proud to introduce and offer for sale the new Miken Halo Fast Pitch Softball Bat, 98 mph ASA 2004 approved and USSSA 1.20 certified. When they made this bat the actually had to beak the mold. This bat can no longer be produced as it would not pass the 2009 ASA guidelines, however it is grand fathered legal. It just does not get much better than this. The Miken legend lives. 100 percent composite bats are what Miken knows. One swing of the Halo will convince you that Miken knows composite technology very, very well. Miken has taken the power of a composite bat further than they thought it could go. 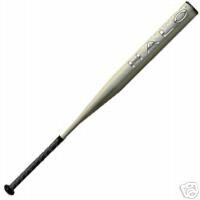 This bat is called the Halo. Fitting! The Halolpushes the 98 mph limit garnering all the pop allowed. Miken presents the Halo with new cutting edge frontier breaking technology. Miken innovation has successfully combined the E-Flex technology and the Titan Elemental Technology and the rules of how a ball is propelled off a bat not longer quite apply. What this means to you is that you go to the plate with the power of an enhanced trampoline effect. What this means to your opponents is that they will be leaving the tournaments early and wondering how the ball exploded off the bat incredibly fast. The Halo is the bat of choice for the best fast pitch players because without it they wont be the best for long. Swing high and swing low... Halo crushes the ball, but do not forget to touch all the bases. The Halo is approved for ASA, NSA, ISA and USSSA.